Meditation is a very effective tool in overcoming anxiety habits but first it is necessary to be clear as to exactly what we mean when we talk about meditation. In recent years, with the upsurge of interest in mindfulness, many people use the terms interchangeably. 1. Is meditation the same as mindfulness? 4. What is the best way to learn to meditate? Mindfulness is an approach that incorporates meditation practice but it has other features as well. Mindfulness also teaches us to become aware of our judgmental and resisting tendencies in general and to address these as these are habits which create negative arousal, hence stress. There's a fuller description of Mindfulness on its own page. Click the link for more. There is a form of meditation, known as "mindful meditation", which is taught as part of Mindfulness. More about this below. You can do mindful meditation without the other bits of Mindfulness although you probably wouldn't want to. Meditation means allowing yourself to simply be. It's about not thinking about anything that comes into your awareness but just being aware of it. When meditation is taught as a therapeutic application it is often initially done in short bursts. In this context it is often referred to as being mindfully in the moment. The term 'meditation' is usually reserved for longer, more intense sessions. Being mindful means being aware of where you are here and now. Being aware of the input of whichever of your senses (touch, hearing, taste, sight, movement) you are choosing to be mindful of. In other words, when using mindful meditation to reduce anxiety the sufferer consciously chooses what to focus on - usually anything other than their thoughts or anxious feelings. Mindfulness meditation teaches being “in the moment”. It encourages the re-development of the ability to keep our minds and our bodies together, as they were designed to be. This activity alone tends to make us feel calmer. Many of the places our minds go are not good places. All too often they involve worry, regret, guilt, and all manner of other negative emotions. Negative emotions which are only with us in the present moment because we are bringing them along in our heads. Non-directive meditation is meditating without choosing to focus on anything in particular. It is allowing an awareness of whatever enters the mind but not hanging onto it or thinking about it but letting it pass as and when it does. There's a form of non-directive meditation often taught in mindfulness training, known as "Choiceless Awareness". This is probably quite a difficult meditation for a complete beginner and one of the other forms of more directive mindful meditation would be better to start with. A guided meditation is one in which you either listen to a recorded voice or that of a teacher. The voice tells you what to be aware of and you simply follow instructions. Beginners usually find this method the easiest. Chanting meditations involve repeating a mantra of some sort. Again, this is not usually easy for a beginner. The Loving Kindness meditation comes from Buddhism where it is known as metta havana. It involves five distinct steps. The meditator begins by focusing their awareness in a particular way on themselves. Next the focus moves to someone for whom they feel unconditional loving kindness. Third is a focus on a neutral person whom they neither like or dislike. Next they direct their awareness to someone for whom they have some kind of negative feelings. Finally the focus is on all living things. This meditation combines visualisations and feelings. Research suggests that this is the most effective of all meditations yet it takes many years of practice to perfect it and it you not be easy for a beginner. To do a mindful meditation you decide beforehand what you are going to focus your awareness on. Usually this is the input of one of the senses i.e. what you can feel touching you somewhere, what you can smell, what you can hear, or what you can see. The idea is to be aware os the sensations but not to think words about them. This approach uses mindfulness but meditations are very short for those who initially find longer ones unattractive or difficult. 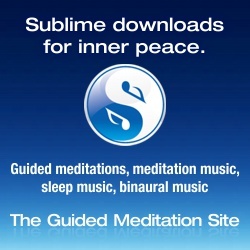 There are three simple and very brief meditation exercises on the downloads page which you can try to begin with. The tracks are self-explanatory. There is one describing how to meditate on breath, one on touch and the third on sound. If you require something longer or slightly different, there are many meditations of all kinds available on the Guided Meditation Site (more about this site in the Products section) There are also more detailed instructions about how to meditate. You don't have to have silence in order to meditate - you just have to allow sound to wash over you and not focus onto it. You don't have to be alone to meditate - you can allow yourself to just be when amongst others if appropriate. Obviously there are times and occasions when it would be unwise and even dangerous to meditate such as when driving, when you are being paid to do a job, when you have to take care of your safety or that of others in any way. In our busy everyday lives many people say they don't have time to meditate! But meditation can be done in very small time spaces and this is where it becomes useful in the treatment of anxiety. 5. How does meditation reduce anxiety? The use of language lets us easily imagine scenes and events which are not present in the here and now. All too often we visit these. Most of us spend most of our time with our bodies in one place and our heads somewhere else entirely. Anyone who experiences anxiety will soon realise, if they monitor their thoughts, that it is what they are thinking that is causing them to feel anxious, not what is actually going on in that moment. Therefore, if we develop an awareness of when we are thinking about things that make us feel anxious and we move our thoughts away, the anxiety will reduce. A good technique for relocating unhelpful thoughts is to simply allow yourself to lapse into a mindful meditation on something like your breath for a few seconds. This, of course, is easier said than done which is why meditation is something that requires practice so that we can more easily over-ride the thinking habits which we have all unwittingly developed. But it is a case of being aware of the unwelcome thoughts and then of moving our minds elsewhere. It is not about trying to block out the unwelcome thoughts or to distract ourselves. Until the 1970's medical science believed that the structure of our brains could only be changed by either an operation or accidental damage of some sort. Research started to show that changes could be made to brain structure by the way we behaved. This ability of the brain to change in this way is known as 'neuroplasticity'. Buddhists have been meditating for thousands of years and Buddhist monks are extremely good at it. In order to evaluate the benefits of meditation and to better understand how the practice affects the brain, the Dalai Lama who is the head monk of Tibetan Buddhism, has been cooperating with neuroscientists. An article on his website suggests that maybe our thoughts can indeed create physical changes in the brain. Brain activity is traditionally measured by an EEG (electroencephalogram). This gives an output of brainwaves as wiggly lines on a page. The brainwaves we know most about are the beta, alpha, theta and delta (see page about subliminal messages) but recently another frequency brainwave has been identified in humans - the gamma wave. The gamma brainwave is faster than all the others at 25-100 Hz and is associated with very high thought processes and what monks have called "feelings of blessings". Gamma brainwaves enhance memory functions to exceptional degrees. These brainwaves are most commonly found in Buddhist monks and especially in those who use the Loving Kindness meditation. Research into the effects on the brain of such activities as meditation are only just beginning. Initial evidence is that even if you never achieve the superior meditation performance of those who have practised for years, you can benefit from making a start somewhere because every little helps. Find a way to meditate that appeals to you to begin with whether it's listening to music, to a directive meditation, or whatever. And just take it from there. I also love the sound of singing bowls. The best ones are created from different metals and are shaped to produce very special sounds. You can find examples of ‘singing bowls’ for sale on Amazon as well as elsewhere. There are lots of wonderful pre-recording sounds and musical tracks that can be bought in order to enhance the meditation experience. To read more detail about all the possibilities please click the image link. To gain more understanding of ways in which a Mindfulness approach is relevant to everyday life, look at the articles in the "In the Moment Blog" section.